Motorola has revealed during a MWC 2014 press event that it is developing a new smartwatch. "It's our intention to deliver interesting wearable technology - we are developing a watch which will be coming out in the next year," Rick Osterloh, SVP product management, said at the event. "Our main focus is that we will start to solve a real user problem in that there are no wearable products you want to wear - all because they are all extremely ugly. "So we want to solve the problem of making this a style item like jewelry or clothing," he continued, taking a clear swipe at Samsung and its Galaxy Gear, Gear 2 and Gear 2 Neo smartwatches. "We'll be announcing [the watch] in a few months so stay tuned, but [wearable] is very interesting to us." Update: Motorola also discussed its new smartwatch on Twitter, writing, "We are working on a watch that will be available this year. We aim to address consumer issues like style & battery life." The watch will be an Android device, said Steve Horowitz, SVP software engineering. "I can say we are 100% focused on Android. [The] market has spoken as to where the OS focus needs to be and we will continue with that strategy. As time possesses we will have conversation but I am very focused on Android," he said. When asked if that meant that the smartwatch would be running Android Osterloh joked: "I can say that it won't be running Tizen!" The smartwatch will continue the Moto brand, the executives said, something that may have been called into question since Lenovo recently purchased the company from Google. 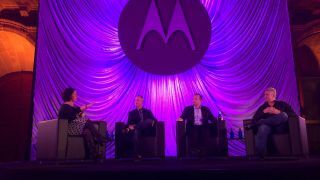 Lenovo answers burning questions about Motorola, addresses future of phones.